(Highlight to View) Prompt: A scene of your choice from "The Princess Bride" but with SS and HG instead of Buttercup and Westley. Note: The scene I wanted, plus some extras, modelled after an old VHS cover. 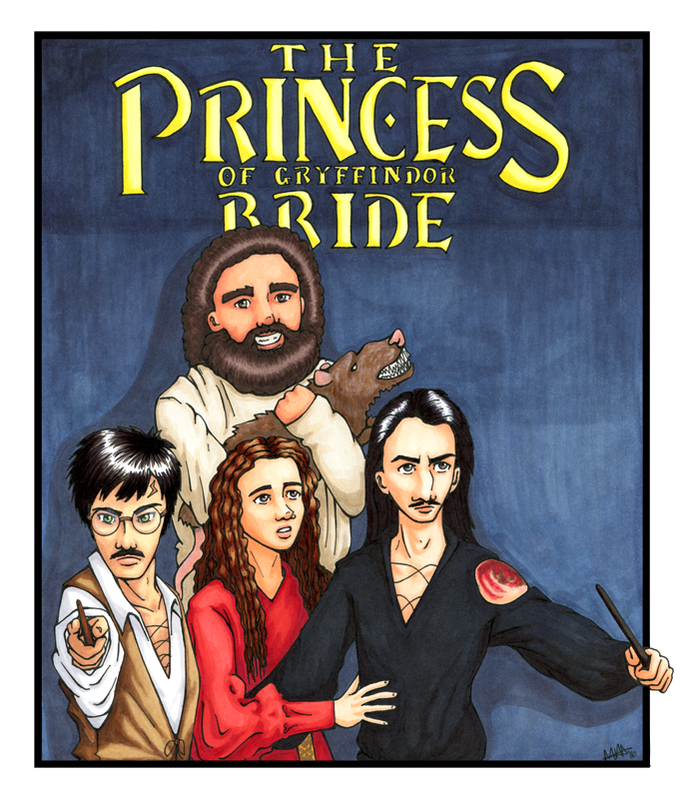 I hope you don't mind the inclusion of Harry (as Inigo) and Hagrid (as Fezzik). Originally drawn and coloured in Copic ink; scanned and touched up in Photoshop. Summary: Having just emerged from the Fire Swamp, Severus protects Hermione from her fiancé and his goonies. Meanwhile, Harry attempts to avenge the murder of his parents, while Hagrid makes friends with an R.O.U.S.